We were given a DVD and plush character to review. 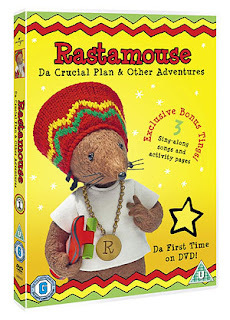 When Rastamouse first started on CBeebies, I wasn't sure about it. I heard so many other Mummy Bloggers on Twitter talking about it and how they loved it but I just didn't know if it was something that I would be able to get into and it is only if I show enthusiasm for a new programme that Big Boy or Top Ender show any interest. Eventually I managed to get everyone to watch it together and Big Boy quite liked it, even I thought that the crime solving antics and the idea that everyone gets to make up for the bad thing that they have done rather than being punished was a good thing for Big Boy to learn. We were asked if we would like to review the newly released DVD (Da Crucial Plan and other adventures) and when it arrived, I got top Ender to sit down with Big Boy to watch it whist I pottered about doing the dishes in the kitchen and preparing our evening meal. Top Ender was a little annoyed as at seven years old she thinks herself too old for anything on CBeebies, but when Big Boy told her that it was good she agreed to watch it for a few minutes to humour him. When the DVD ended Rastamouse had a new fan in the form of Top Ender. Along with the DVD we were sent a Rastamouse plush Toy, which hasn't been out of Big Boy's hands since he took it out of the packing. He loves it so much that I had to steal it off him, when he was sleeping in order to take this picture! The plush toy stands 9inches tall and when you squeeze his stomach he either sings or says one of his phrases from the show. The other three main characters are also in plush form and I think that Big Boy is after them for Christmas as he has loved playing with the Rastamouse toy and we have been waking up over the last few mornings to the gentle strains of Rastamouse filling his bedroom which is much better than the usual MUM! DAD! I'M AWAKE! MUM! DAD! I WANT SOMETHING TO EAT! The DVD and the Plush Toy has an RRP of £12.99.